Columbus is a food city, and in addition to the best taco truck scene in the Midwest, we&apos;ve got more than our fair share of other mobile eateries. Here are our recommendations for great food truck dining in Columbus. Sweet Carrot - Fried Arts - Sweet Carrot is known for these tender, cornmeal-dusted fried artichoke hearts. Make them a meal by ordering the version where they&apos;re served on top of a corn cake and mac and cheese or pulled pork. 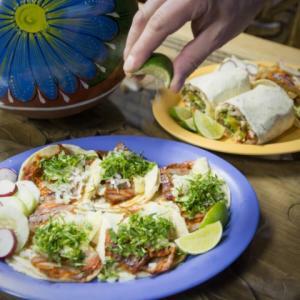 Los Guachos - Tacos al Pastor - We would be remiss to leave these delicious tacos off this list, even though they also showed up on our post on 10 Columbus Dishes You Have to Try. Pork slow roasted on a vertical spit with pineapple and onion and served with cucumber, raw onion and cilantro. I dare you to find a better taco. Los Potosinos - Pollito al Carbon -Lidia Labra grills some of the best chicken in the city at the two Los Potosinos locations. Her marinade is a closely-held secret, and after one taste, you&apos;ll be back for more. Call a couple hours ahead and grab some chicken for your next picnic. Mya&apos;s Fried Chicken - Fried Chicken (of course) - This small truck serves up what many people call the best fried chicken in the city. Crisp, not-too-thick breading covers tender, all-Ohio, raised-right chicken. Don&apos;t skip the biscuits or mac & cheese. Ajumama - Pajeon - Laura Lee&apos;s truck serves up some of the best Korean street food in the city. The pajeon are a staple on the menu, which often incorporates daily specials. These thick, eggy scallion pancakes can be studded with a variety of ingredients - from chicken to pork to vegetables. They come with a delicious dipping sauce. Ray Ray&apos;s Hog Pit - Brisket - The best barbeque in the city is not found in a brick-and-mortar restaurant, it&apos;s right here at Ray Ray&apos;s in the parking lot of the Ace of Cups bar. You can&apos;t go wrong with anything you pick, but the beef brisket is a winner all-around. The braised greens make a great side. Green Meanie - The Green Thumb - This vegetarian sandwich layers grilled portobello mushroom, avocado and tomato tops them with a duo of house-made sauces. Challah - Smoked Whitefish Sandwich - A challah roll is topped with creamy and not-too-smoky whitefish, sweet pickled beets and a latke. A tremendous flavor combo that takes me back to my grandma&apos;s kitchen. 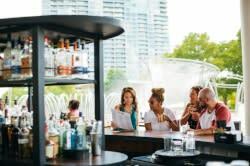 To learn more about food trucks in Columbus, visit Street Eats Columbus or take a food truck or taco truck tour with Columbus Food Adventures!